This is one of the first shoots that I did for Workbench magazine. It was on location at a tool museum in Lee’s Summit, MO. An unheated one in winter, if memory serves me well. 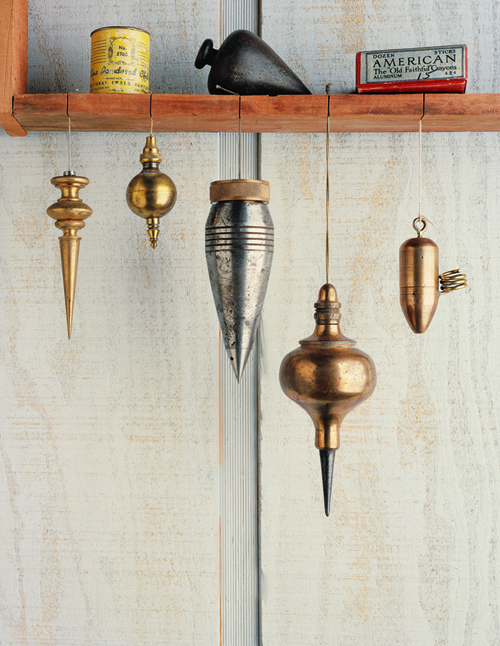 You’re looking at a pretty amazing assortment of plumb bobs. Most appear to have been designed in an era when craftsmanship was more highly valued than the fast dollar. A man took pride in the work of his hands and that philosophy served him well. But there again, that’s coming from someone with the same work ethic, as I’d rather do right by the subject matter, than take short cuts that compromise quality. Can anyone guess as to the function of the plumb bob on the far right, with the spring gizmo attached? This image also ran as a mini-feature in Photographer’s Market, a hardback book published yearly covering avenues of sales and revenue for commercial photographers. You can see a larger image here. ~ by Johnny on September 23, 2008. As a matter of fact, no, i have no idea what that little spring gizmo is all about! But it sounds like another blog is in order… the uses of antique tools in modern society? Or, great photo props and Lots of questions?! If you didn’t want to strain out sand between your teeth, you’d use one of these. Oh yeah – Wonderful picture too, as all of the ones that i’ve seen have been! Thanks. I’m looking forward to those yet to come, considering most of these were born in a time of incredible pain in my life. But God is good and I’m no longer dealing with those issues, as I once was. So, better things await. The spring is a candle holder… now why?